Performances – Good Practice Good Health Inc.
Gippsland Health Summit will host a number of performances. The performances will be followed by a panel discussion and we invite all community members to join us as we learn together what can support our communities to be caring and resilient, in ways that can improve our mental health and our understanding of each other. 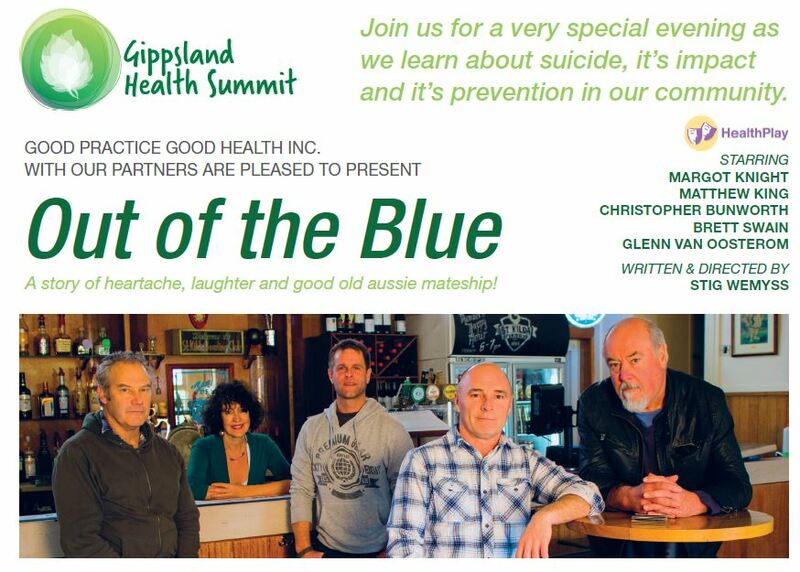 Out of the Blue is a play set in a hotel bar, where locals have gathered to pay tribute to a mate they have lost to suicide. Based on the ‘Out of the Blue’ project by Bass Coast Health Phillip Island, the first production of the play saw instant identification and an overwhelming reaction, suggesting the play is vital, especially in rural areas, where the problem of suicide is a threat to many communities. It offers a powerful pathway to sharing, conversation, action and, hopefully, change. Supper will be provided. After the play we will host a conversation with health professionals and members of our community who have been touched by suicide. Download Out of the Blue Flyer for booking details. Orbost Monday 20 March 2017 7.00 pm Orbost Exhibition Centre, 8 Clarke Street. Sale Tuesday 21 March 2017 7.00 pm Esso BHP Billiton Wellington Entertainment Centre, Foster Street. Leongatha Wednesday 22 March 2017 7.00 pm Mesley Hall Leongatha Secondary College, Ogilvy Street. Gold coin donations will be donated to local community agencies in each town we visit. Mental health issues are increasingly understood to be issues for the workplace. For example, the ‘black dog’ of depression has many colours and affects a significant number of people throughout their working lives. “My Dog has Stripes” is a short play which involves professionals in the workplace, one of whom has an emerging issue with depression, and models some of the issues that workers and their colleagues can face, in a way which provides both insights, and practical solutions. In a short, but powerful piece of high class drama, the HealthPlay cast of Margot Knight, Marcella Russo and Lee Mason opens up a lesson for all involved and interested in personal development. Rather than being ‘heavy’, the play utilises HealthPlay’s unique and sensitive approach to tackling challenging issues with comedy, in a way which does not trivialise the issues, but makes them easier to talk about. The play is followed by a facilitated discussion, allowing participants to explore the key insights and messages of the play. Research tells us that experiential learning is a powerful and effective tool for professional development. 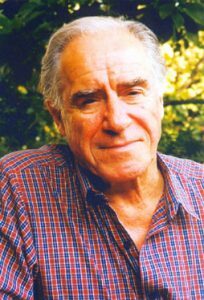 HealthPlay, led by Australian actor and playwright Alan Hopgood AM, has spent 20 years developing and delivering plays which are thought provoking and provide audiences with the opportunity to explore challenging issues, providing exceptional insights. And they do it, crystallising real life stories, using a subtle and effective blending of challenging issues and comedy.